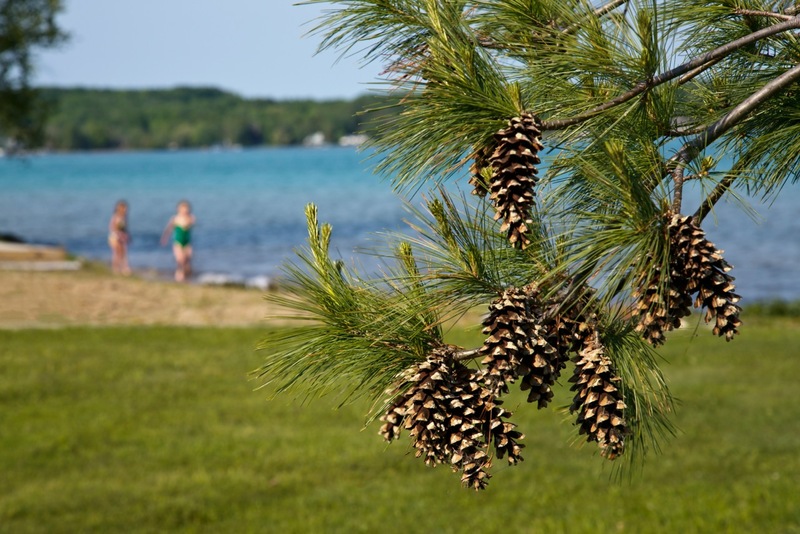 Babs Young writes: The west side of Torch Lake seems to be warm enough for swimming. The little Ostrander girls have been in and out for two days with no complaints. I’ll wait a few more days. Weather not too bad here either — but the Atlantic Ocean is bitchin’ cold. Gerry, you’ll at least have to put your feet in the Atlantic when you visit. Has Sybil forgotten she was photographing jellyfish in Halifax harbor last month? Things are warming as we write. Forgot to mention those lovely white pine cones. I’ve noticed more than usual on the trees here too. They would be part of last year’s crop. I used to pick basketfuls of unopened ones for the Department of Lands and Forests on my grandparents’ land when I was a child. They’d use them to seed new trees. I know they’re Michigan’s state trees but also special to me too. So much to like here – the pretty blue water, the growth on the pine trees, the slightly out-of-focus girls waiting for full summer to come into focus. I see Antrim County’s under the gun right now weatherwise – hope those storms don’t get too severe. Funny you should mention the storms . . . Right here on my side of the County we had thunderstorms with plenty of rain but nothing to get excited about. Just a few miles east I understand there were lengthy power outages and all manner of storminess. You just never can tell. This rolling lake country is chock full of microclimates. I have been known to pull out of the driveway humming to myself, perfectly comfortable in a fleece top and jeans, and ten miles later step outside the car into suffocating heat. I got wise to that pretty quick, and now dress in layers. It saves me an awful lot of awkward emergency t-shirt purchases. It was a pistol there for awhile wasn’t it – but nice this afternoon. Very nice indeed. Probably. But there are lots of little lakes that warm up sooner. You’d have a fine time exploring the Michigan Lake District. I only waded in Lake Michigan on Monday morning, but it seemed a good swimming temperature, and inland lakes always warm up faster. When I lived in Traverse City long ago, the neighborhood kids never went swimming in Grand Traverse Bay–always wanted to go to an inland lake. Arbutus Lake would be my first choice down there. It’s so pretty. We are spoiled for choice in Antrim County, but I’ll tell you what – Torch Lake is not like other inland lakes. It is very deep and can be plenty cold right up until July. But it’s always beautiful and clear. And this year, warming well ahead of the usual. Maybe I’ll go check out the Bay this afternoon. Nah – they use the ice floes for paddleboards . . . When I was a kid I always swam in our inland lake on my birthday – April 16. Sometimes it was just in and out…mostly it was cold, but once you caught your breath it was OK. Now I think I’d probably have a heart attack. So I think lakes are warmer the younger you are. It’s some sort of law of nature. I believe you’re right. Many laws of nature strike me as unfair.